When I first stumbled upon Huacachina as the sand-boarding mecca of Peru, I added a new must-do on my bucket list. And then came the images of soaring sand dunes, the legend of a mermaid princess who created the natural oasis that is Huacachina, and the death-defying reviews of dune buggy rides. I was hooked. Huacachina is only 5kms from its sister city, Ica where all the main bus lines stop. The city of Ica is only a 4-5 hour bus ride from Lima, and a $2 taxi ride will get you to the small town of Huacachina. The norm after a stopover in Ica is to get back on the bus south to Nazca, 2-3 hours away. 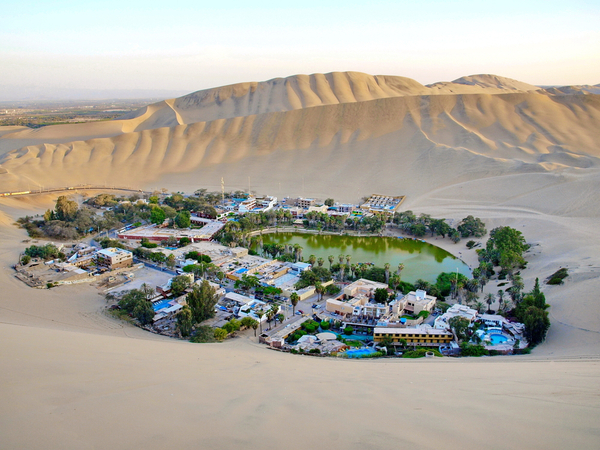 So what is so special about Huacachina and why is it called The Sand-boarding expedition of Peru? 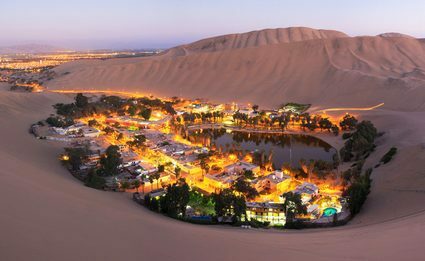 Huacachina is the only oasis in South America, surrounded by massive waves of sand that stretch to the Pacific. 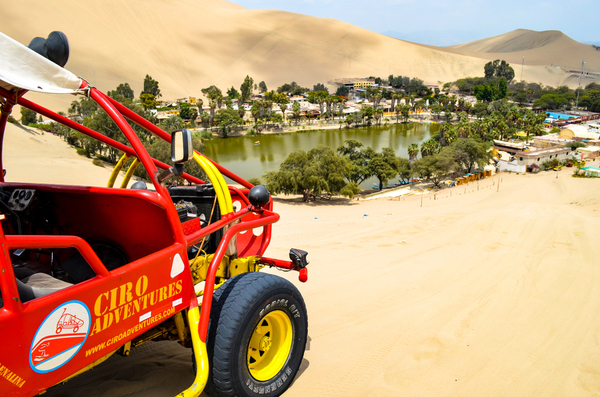 It is now known as the best place in Peru to get your thrills on a sand-board and a dune-buggy. You can even fork out the cash to hire your own 4×4 and explore the mounds by yourself. It’s quite the tourist town (less than 200 people live there permanently) so expect to see a lot of backpackers wanting the same experience as you. After hours of playing on the hot sand dunes, you can relax by the plethora of swimming pools with a book, and regain your strength for the nightlife ahead. As the town depends entirely on tourism, and the majority of clientele are young adventure-seekers, there is a lively night scene, to say the least. Keep in mind that it’s a small isolated village, meaning food and drink prices are more expensive than the rest of Peru. Ica shouldn’t just be transferred through either, it is known as the land of the sun because of the cultivation of grapes, asparagus, and olives, among others. 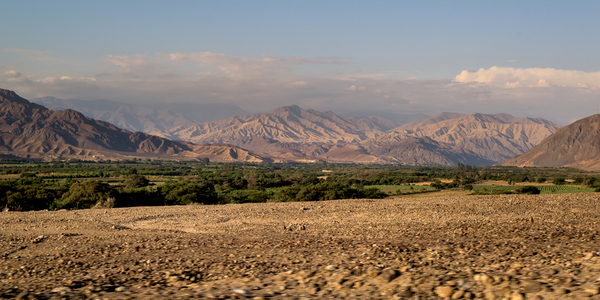 The Ica Valley is also the biggest wine producer in Peru, well something a little stronger than wine… Pisco. There are many winery and bodega tours where you can learn how to make the Pisco Sour and sample, sample, sample the day away. Nazca Valley, in Ica, Peru. Desert Nights is the only Hosteling International hostel in Huacachina. It lacks a swimming pool and dance club, which is a norm for the other resorts here. However, this hostel does offer a really good location and is clean and affordable. Casa de Arena is a popular backpacker hostel, also known as the night-time party center in Ica. So if you’re after a more relaxed weekend where sleep is before sunrise, this probably isn’t the place for you. This hostel does, however, have a swimming pool, bar, restaurant, disco and even a volleyball court. Huacachinero is another good budget option, however less popular than Casa de Arena, but with better facilities. It has a swimming pool, bar, hammocks, and they offer camping as well as hostel accommodation. If you’re unsure yet whether you’re going to make the trip to Huacachina… remember the adrenaline-filled adventures we spoke of. However, be aware, it looks like Huacachina is rather tricky to get to if you’re not starting from Lima (direct north) or Arequipa (direct south). But the opportunity to try sand-boarding in this picturesque village may be worth the expedition after all.